Laura Kinney uses assassin training paired with powerful claws to take down anyone who makes the mistake of crossing her. Series 1 of the Deadpool Legends featured X-23 in her X-Force team uniform, and we said they should have done her in her blue-and-yellow Wolverine suit; now here comes Series 2, delivering exactly that! When Logan died, Laura took the Wolverine codename in his honor. It was during that phase when Marvel was doing interesting things with their flagship characters - Thor was female, Captain America was black, Iron Man was egotistical and self-centered... okay, that last one may not be a major paradigm shift, but he did wear some unique armor at the time. Anyway, while losers were recording 40-minute YouTube videos about "forced diversity," Wolverine was still being the best there is at what she does - it's just that "what [Wolverine] does" expanded to include "shedding her uterine lining." 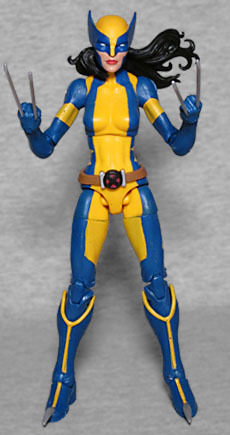 The first costume Laura wore when she joined the X-Men (under the codename "Talon," though everyone seems to have forgotten that) was the one Wolverine took off the Shi'ar Imperial Guardsman Fang, then only wore for, like, two more issues. Anyway, the point is, she's got a history of wearing Logan's hand-me-downs, but making them look a whole lot better. The toy still uses the teen body, which... might be right? It's hard to say how much time is supposed to have passed since she was introduced. It's possible she only seemed like an adult because there were a bunch of younger kids around her. The face would appear to disagree with that idea, however. Or, the faces: Wolverine comes with two of them. 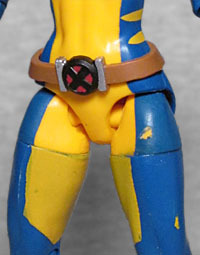 The standard head is wearing that famous Wolverine mask, though its "wings" are blue instead of black. Here the hair spills out the back of the mask, which Logan's was never long enough to do. The way it billows in the wind makes the figure look dynamic even when she's standing still. But still not like a kid. The alternate head in the pack is unmasked, with the hair hanging straight down, and the thinness of the face definitely makes her look like a fully grown woman. 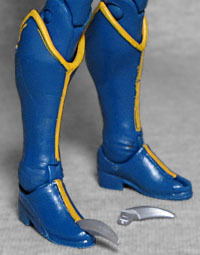 The costume details are only painted on, but she does have new boots to create those classic Wolvie flares. The painted yellow (on her legs, for instance) doesn't come close to matching the molded yellow, annoyingly. The left thigh swivel on my figure is stuck fast, and when I was trying (unsuccessfully) to get the joint moving, I accidentally scraped a spot of the blue paint off her hip, so that will need to be touched up. Her brown belt is a separate piece floating around the waist, with silver, black, and red for the X buckle. Like the last figure, she gets fists with removable claws. That trick is seven years old now, and it never ceases to be awesome. 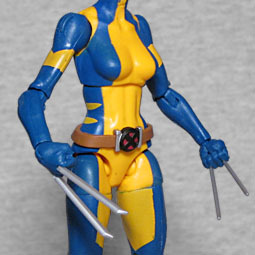 Woverine goes one better than X-23 did, though, remembering to include her third foot-claw! Hooray! It's not hinged, like the ToyBiz figure's, but it is removable just like the ones in her hands. You want a Wolverine with no claws out? You can do that! She also includes a piece of this series' Build-A-Figure, Sauron - specifically, the left arm and wing. Gotta have that! There's no building a pterodactyl-man without his wings. As we once explained, DC Comics did a lot of "testing the waters" before officially introducing a Supergirl. 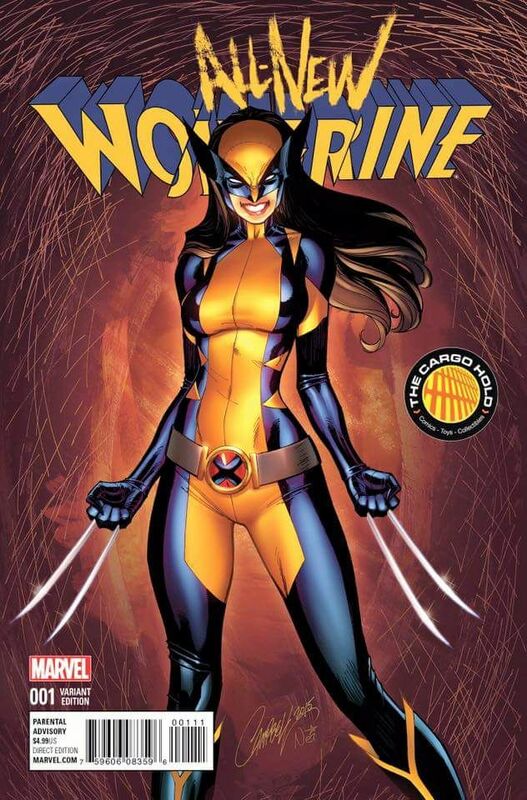 Similarly, X-23 is not the first female Wolverine: first What The--?! #9 introduced Wolvie's "cousin," Wolverina; then, a year or so later, Guardians of the Galaxy #9 gave us a more serious (read: "grimdark") version of the same character with Wolverine's descendant Rancor. Laura is a more original character than either of them, even with inheriting Logan's old supranym. It's good that Hasbro wasted no time in making her a toy.